Food magic and wizardry – served hot! So in a previous post I told a story about how I hated fried rice, but how one magical ingredient changed all that, and now fried rice and I can set aside our differences and live in harmony. Well, there was a catch. The rice in that recipe wasn’t technically fried. It was reminiscent of a teppanyaki-style fried rice, but it was, in fact, baked. I’m sure this low-level illusion spell didn’t catch many readers off guard. Probably because you casted “detect magic”. I see what you’re doing. Assuming for a minute that you still learned the central moral of that story, that toasted sesame oil is amazing, let me tell you about another ingredient that made life easier, instead of just better. Powdered peanut butter. The worst part of using peanut butter as an ingredient is always measuring and mixing in the peanut butter. I love peanut butter, and there’s no reason to be that mad at something you love. Powdered peanut butter is tasty, and has all the best characteristics of peanut butter, but is 1000% easier to measure and use in recipes. Imagine how much more peanut sauce you’d eat if it weren’t frustrating to make peanut sauce? The answer is, barring allergy, rather a lot! I am no longer reluctant to try peanut sauces or salad dressings! And even more than that, I was able to combine both secret ingredients for a spell that is practically weaponized delicious, and makes a dinner that comes together in 20 minutes out of leftover rice and relatively fridge-stable kale! It’s the late-week dinner you’ve been looking for after a long day at the enchanting table! In a small bowl, combine the powdered peanut butter, water, liquid aminos/soy sauce, vinegar, sriracha, and ginger. Mix with a fork, and add water 1 Tablespoon at a time until the sauce is runny and all the peanut butter is dissolved. This usually takes 2-3 Tablespoons for me. Heat toasted sesame oil in large skillet or wok over medium-high heat. Add garlic, and stir a bit until fragrant. Add the rice and sauce. Stir frequently until the rice starts to brown and sauce thickens. This should take about 5-7 minutes, but you can continue cooking as long as you like to get the rice up to your preferred level of crispness to the rice. Add kale and peanuts, stir well and cook for an additional minute or two until completely coated and heated through. Remove from heat. Serve hot! I'm enthusiastic about food, but wanted to share recipes and write without the seriousness that frequently accompanies heath food... so I decided to keep it lighthearted and write from a mage's perspective! 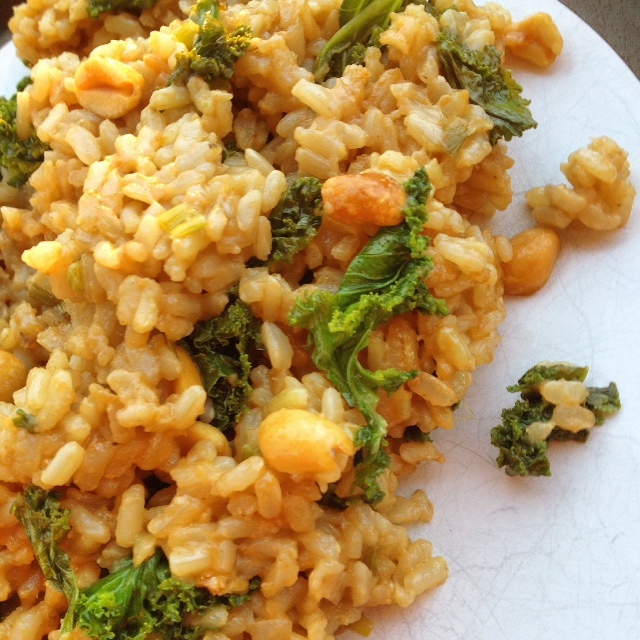 This entry was posted in comfort food, Magic Upgrade, quick dinner and tagged clean up, comfort food, dinner, easy, healthy-ish, homemade, rice, spicy, vegan. Bookmark the permalink. this rice looks super delicious!! It’s one of my favorites! Hope you enjoy it! New spells every week delivered to your e-mail!